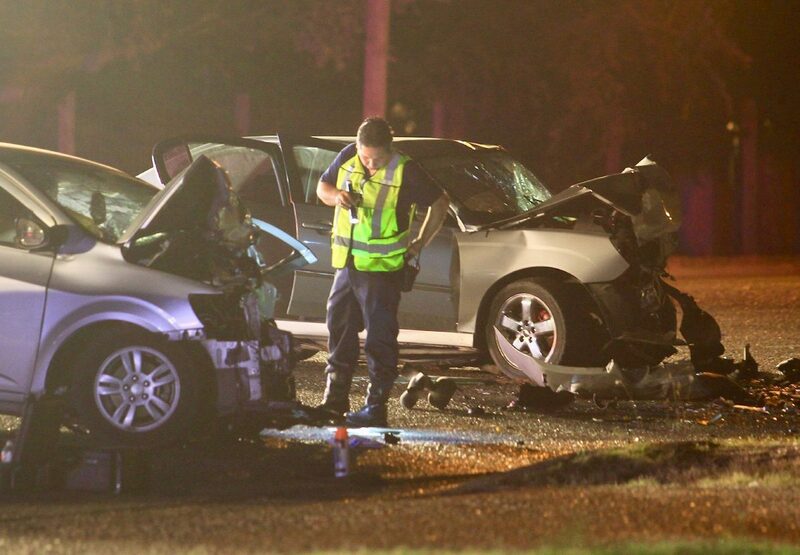 An investigator surveys a two-car, head-on collision Thursday on Monte Cristo Road in Edinburg. Three people died in the crash. EDINBURG — The 19-year-old driver involved in a fatal head-on collision that claimed three lives Thursday night may face criminal charges, according to Edinburg police. The preliminary investigation revealed that the driver, whose identity has yet to be released, is believed to have been under the influence of alcohol or drugs at the time of the two-vehicle crash on Thursday, Lt. Oscar Treviño, spokesman for the Edinburg Police Department, said. Officers responded to a call of a major accident in the 300 block of East Monte Cristo Road at approximately 9:26 p.m., after the 19-year-old’s 2006 Chevrolet Malibu veered into oncoming traffic, striking a 2014 Chevrolet Sonic. The Sonic’s driver — 55-year-old Maria Isabel De La Garza of Edinburg — died at the scene along with her daughter, 33-year-old Marci Lou Powell of Edinburg, and grandson, 3-year-old Joshua Devin Powell of Edinburg. Another one of De La Garza’s passengers, a 31-year-old female whose identity has not been released by police, remained hospitalized in serious condition as of press time. The Rio Grande Valley Border Patrol Employee Association created a GoFundMe account for Aaron Powell, who lost his mother-in-law, wife and son in the crash. Powell is a support staff employee assigned to the Rio Grande Valley sector’s Office of Information Technology, according to the GoFundMe page. The 19-year-old driver remains hospitalized in serious condition and under police watch, said Treviño, who noted the teenager will likely remain in the hospital for a few more days, at which point he will be charged.